Kath Wood of Remploy writes that teachers and trainers in the Further Education and Training sector may be missing the potential in their learners who have dyslexia, dysgraphia, ADHD or Autism. She says it is important to appreciate neuro-diversity and see their different strengths like visual thinking, the ability to spot patterns and themes and their creativity. Teachers/Trainers must take into account individual learning styles to help everyone reach their potential. Chris McNorgan, a psychologist at the University of Buffalo, has produced a neuro-imaging study to help develop tests for early identification of dyslexia. Using fMRI scans on 24 participants of ages 8 – 13, taking part in rhyming tasks, the research seems to show a lack of coordinated processing in the four brain areas known as ‘the reading network’ in the children who struggled with the tasks. Made By Dyslexia has produced some awareness training films using dyslexic celebrities including Keira Knightly, Orlando Bloom and Darcey Bussell. The films cover topics including dyslexic strengths, dyslexic challenges, how to create an inclusive classroom and how to identify dyslexia. Professor Robert Plomin, from the Behavioural Genetics Department at King’s College London claims that diagnosing dyslexia is wrong as there is ‘nothing to diagnose’. He controversially claims that there is no dividing line where you have it or do not. He claims that it is ‘a dimension’. Others argue that dyslexia has a wider impact than just causing reading difficulties. Helen Boden, Chief Executive of the British Dyslexia Association states that it is ‘a complex neurological difference’. This entry was posted in Uncategorised on 11 Feb 2019 by Rebecca Young. Ann Clucas, who has worked as a teacher, a head of department and a SENCO has shared the three classroom strategies she discovered dyslexic pupils most want their teachers to use. Firstly, they want to be given enough time to do a task, secondly, they need visual support for example using diagrams, pictures and mind maps to convey information and using a font size of between 12 and 14 pts for any text and providing printed out copies of any PowerPoint slides so they can follow along easier in class and thirdly, they would like discreet help by having a prearranged learning buddy or using red and green cards on their desk to signal if they need help or not. Cathryn Knight, Lecturer in Education at Swansea University writes on the website The Conversation about her recent research into what teachers know about dyslexia. Her survey found that three quarters of her sample understood it to be having problems with writing, reading and spelling. They had no knowledge of the potential additional issues for dyslexics of trouble expressing themselves, phonological processing differences, decoding difficulties and memory problems. She also reports that the teachers themselves felt they did not receive enough training on dyslexia. Caroline Henshaw reports in the TES that the Department for Education (DfE) is scrapping the need for multiple dyslexia assessments from February 2019. Previously, students who had been assessed with dyslexia at school had to undertake costly second assessments after the age of 16 to receive support at university or work. Fees for the assessments could range from £600 to £800. The move has been welcomed by dyslexia charities as ‘dyslexia does not go away’. This entry was posted in Uncategorised on 31 Dec 2018 by Rebecca Young. 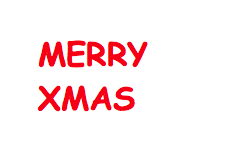 Merry Christmas and a Happy New Year to all our current and future customers! This entry was posted in Uncategorised on 07 Dec 2018 by Rebecca Young. Campaigner Ross Duncan writes an impassioned plea for more inclusion of neuro-diverse people in the workplace. He explains that given the right support someone with dyslexia can be an enormous asset to a company, particularly in the workplace of the future where their skills of vision, perseverance, problem solving, empathy, delegation and creativity will be vital. He is recommending an inclusive and ‘neuro-friendly’ workplace but he knows this will require a cultural change in recruitment policies and training procedures. Driver Youth Trust’s Director of Education, Jules Daulby has written a piece for Schools Week about how to get the most positive effects from specialist teachers in schools. Over her career she has seen specialist teaching go from being a free service provided by the Local Authority to a traded service through the local authority, or bought in by schools privately or sometimes a full-time specialist teacher might have been trained using funding from the Department for Education following the Rose Report of 2009. She feels that the specialist teacher should be assessing, advising and implementing strategies both in the classroom and in interventions. 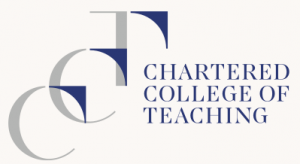 She recommends that the other teaching staff see how the specialist teacher works and what they do so as to provide CPD to the classroom teaching staff in the area of literacy difficulties in children. James Rix, Founder and CEO of Harrix Group writes in FE News about his delight in hearing the content of EY’s report on the future of work. The report states that the skills that a dyslexic person has will be vital in the future workplace. He points out that one of the key conclusions of the report is that dyslexia is still regarded by teachers, employers and the Government as something to be overcome whereas the authors of the report see it as a difference and something that is valuable to society and business. Dyslexic individuals have different abilities to neuro-typical people – strength in creativity, problem solving and communication skills. The European Dyslexia Charter has been launched at the European Parliament in Brussels by MEP Francis Zammit Dimech, with the aim of giving dyslexic people more opportunities to fulfil their aspirations in life. The Charter has been developed because research has established that there is a high level of disparity in understanding and addressing dyslexia across the 28 EU states. Many dyslexics still feel a stigma about the condition. It is estimated that the European dyslexic population is between 50 to 100 million people. This entry was posted in Uncategorised on 01 Dec 2018 by Rebecca Young. A third of Local Authorities face a shortage of dyslexia teachers despite the 2009 pledge from Ed Balls, then Education Secretary, to spend £10million to train 4000 teachers as dyslexia specialists. The Driver Youth Trust have discovered that in the years since the pledge was made only half of the allocated funds have been spent and only 3000 specialists have been trained. The Driver Youth Trust’s Freedom of Information request also discovered that the Department for Education does not record where the trained teachers live and work. Matt Hancock MP, Health Secretary, has spoken about his dyslexia for the first time in print for an interview with GQ magazine. He was only diagnosed at university at 19 years old. He talks about how important technology has been for him particularly Microsoft spellcheck. He feels that dyslexia has helped him to think laterally because he has to work round problems. He is still a slow reader so has to have documents written in a ‘pithy way’ and he writes in the same way himself. Dyslexia support in schools is being made a priority in Borders Schools by the Scottish Borders Council. They are going to run a training programme for staff and issue a comprehensive set of operational guidelines for primary and secondary schools. Councillor Carol Hamilton, Executive Member for Children and Young People has said that the Council wants to make sure that children with dyslexia are ‘identified in a timely way and are provided with appropriate support’. Professor Nigel Lockett, the Dyslexic Professor, who first appeared in the Monthly Dyslexia News Digest in May 2017, is continuing his campaigning for better understanding of dyslexia as a learning difference not a learning disability. He went public with his own dyslexia in 2017 to help people see that anything is possible with the right support. He blogs at www.nigellockett.com and is Professor of Entrepreneurship at Lancaster University. McDonald’s branches in Sweden supported World Dyslexia Day this year by making all of their digital outdoor ad displays simulate the effect of dyslexia by jumbling up the letters out of order. The in-restaurant menus did the same. The ad campaign was an attempt to demonstrate the daily frustrations for dyslexic people. 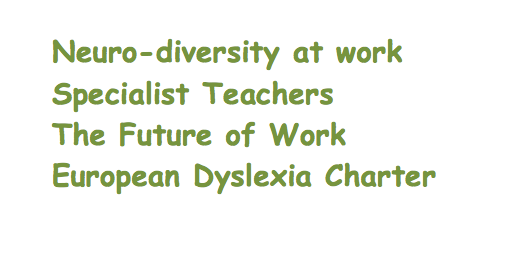 Made By Dyslexia has published a report called “The Value of Dyslexia: Dyslexic strengths and the changing world of work” on future work-related skills and abilities and how dyslexics possess them. They are campaigning for neuro-diversity in business and better support for dyslexic children in school so they can reach their full potential. Read the full report “The Value of Dyslexia” from Made By Dyslexia and EY at the following link. Nick Jones the creator of the private members’ club chain Soho House has given an interview to GQ Magazine about how he feels that his dyslexia has helped him as an entrepreneur. He says that he was lucky that his Mother spotted his dyslexia at age 11 or 12 and sent him to Shiplake College, which specialises in dyslexia. He says that his dyslexia makes him look at things differently and create things differently. Alistair Low, a games designer based in Dundee, has produced a game to show players what it is like to have dyslexia. The game is called A Familiar Fairytale and is text-based. It uses jumbled letters to simulate the frustrations typically experienced by someone with dyslexia. This entry was posted in Uncategorised on 31 Oct 2018 by Rebecca Young. Come and visit us at the Dyslexia Scotland Conference. Venue: University of Strathclyde (Technology and Innovation Centre), 99 George Street, Glasgow G1 1RD. 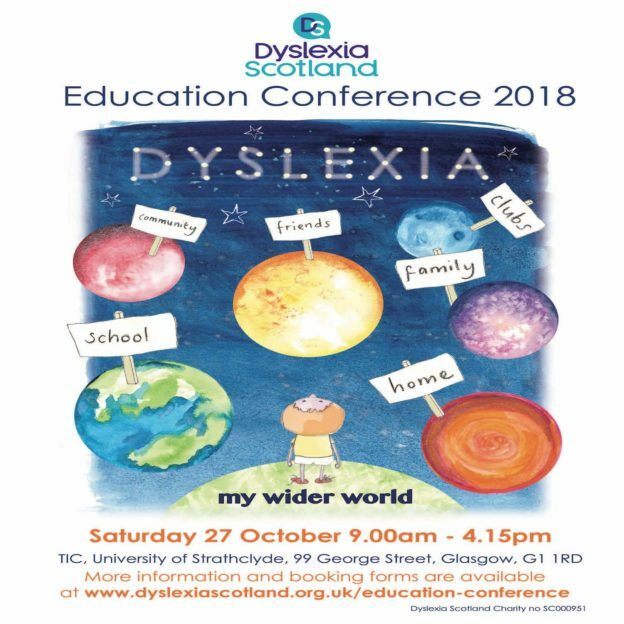 Audience: this conference will appeal mainly to primary and secondary class teachers, Headteachers, support for learning practitioners and other educators working with children and young people with dyslexia in a learning setting. This entry was posted in Uncategorised and tagged #mywiderworld on 15 Oct 2018 by Alasdair Andrew. Sally and Bennett Shaywitz have been researching dyslexia for decades. They run the Yale Center for Dyslexia and Creativity. Much of their research has drawn on data from their longitudinal studies on a cohort of children from kindergarten entry to mature adulthood. They have studied the prevalence of dyslexia, the gender composition, long-term outcomes and economic consequences of dyslexia in adults. Sally Shaywitz wrote “Overcoming Dyslexia” in 2003. Bennett Shaywitz is using fMRI (functional magnetic resonance imaging) to try and discern a ‘neural signature for dyslexia’. Matt Boyd, Founder of Exceptional Individuals has launched a 6 week training course for neuro-diverse people to help them improve their chances of gaining employment. As a dyslexic himself he feels the job selection process of replying to job adverts and being interviewed is tougher for people with dyslexia and that their talents can be overlooked. The Exceptional Individuals own website has a Jobs Board called Incluzy and the website provides support and ideas for job search for neuro-diverse individuals. BBC 4 broadcast the documentary “Farther and Sun: A Dyslexic Road Trip”, which is a film made by Richard Macer with his 11 year old son, Arthur exploring whether dyslexia is a disability or a gift. Arthur was diagnosed at age 9 and Richard has always suspected he himself is dyslexic but was only tested during the making of the film. 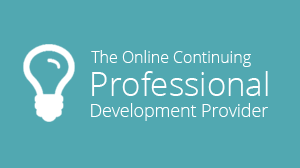 The assessor discovers that he has a Specific Learning Difficulty because he has developed good compensatory skills. The pair visit academics including Maggie Snowling and Julian Elliot and successful dyslexics like Richard Branson and Eddie Izzard to learn more about the debate around dyslexia. The hour long programme is still available to watch on the BBC iPlayer. This entry was posted in Uncategorised on 09 Oct 2018 by Rebecca Young. Dyslexia: to disclose or not? August has been a quiet month for dyslexia stories but that just allows us to highlight some of the work done by the West Lothian Dyslexia Network on Dyslexia and Disclosure. West Lothian Dyslexia Network is made up of a range of partners in housing, employment, learning and community-based services, who work together to enable fair access to services for adults with dyslexia. The network’s members identified that some of the adults they supported were reluctant to disclose their dyslexia, which makes it difficult to put relevant adjustments in place. The network decided to conduct a survey to get a better understanding of people’s motivations relating to disclosure. Although some respondents had positive experiences to share on disclosure, many had felt discriminated against. Interestingly the survey found that younger people are more likely to disclose with all the respondents who were 25 or under doing so to help with work or learning. Follow the link on West Lothian Dyslexia Network’s webpage to download the full article originally published by Dyslexia Scotland. This entry was posted in Uncategorised on 03 Sep 2018 by Rebecca Young. John Spence writes about overcoming dyslexia, attention deficit hyperactivity disorder and Irlen Syndrome. He had a difficult time at school in the 1970s and 1980s due to the conditions being undiagnosed. He thought it was normal to see ‘words swirling in 3D’ on the page but it meant he struggled to learn to read. In order to hide his difficulties, he developed a persona as the class clown and learnt things by heart. He was good at practical biology and left school with an ‘O’ Level in Home Economics. He joined the military and enjoyed it because it was practical and physical. It was during his time in the army that the fact he could not read was uncovered. It led to him returning to education at the age of 34. He took a degree in biological medicine and health sciences at the Open University. An educational psychologist diagnosed him with Irlen Syndrome and he was able to use his Disabled Students’ Allowance to pay for a tutor. He used a laptop with read and write and speak and spell programs and had any reading material printed on green paper. It took him 9 years to complete his degree. He is now an Ambassador for the OU alongside his work in the military. The advertising agency Leo Burnett London has won the digital creative competition run by Ocean and Campaign for its ‘A moment of dyslexia’ ad for the British Dyslexia Association. The ad uses facial-detection technology on Ocean’s digital out of home screens which can tell how long someone looks at the screen and the longer they do the more jumbled the words and letters become as a simulation of what happens to dyslexics looking at a page of text. Brendan Morrissey, a Tech investor is launching a ‘bespoke social network’ for children and teenagers with dyslexia and ADHD called iDyslexic. He is partnered with the Irish Dyslexia Association and plans to tie-in with dyslexia associations around the world. This entry was posted in Uncategorised on 31 Jul 2018 by Rebecca Young.